You can create Dashboard content pages that contain content blocks, and the ReportCaster, Report Library, Watch List, and Deferred Status user interfaces. Accessing the ReportCaster, Report Library, Watch List, or Deferred Status interface from its own Dashboard content page is different than accessing the interface from banner hyperlinks, which open a new browser window when the hyperlink is clicked. Administrators can add content pages for the ReportCaster, Report Library, Watch List, and Deferred Status interfaces to a Public view for authenticated users. When authenticated users inherit the Public View as their My View, they will see the content pages. These content pages are hidden from public users. Content pages appear as tabs that display the name of the content page across the top of the content area. Content pages can be viewed by clicking the appropriate tab. Expand the amount of space you have to display content in Dashboard. Keep the default view created by the Dashboard Administrator and create your own personalized content pages. Content pages are optional. If you have only one content page, tabs do not appear in the actual Dashboard view when you add content blocks. You can create a content page and add a report to it through the Personalize menu, or through the Publish option in published content and private content drop-down menus. Users can create any number of content pages and design the page layout. For more information, see Selecting Content Layout. Administrators can also customize the color of content page tabs (background and text color). For more information, see Customizing the Appearance of Dashboard. You can rearrange the order of the pages using the Move Left, Move Right, and Set Default buttons in the Content window. The Set Default button promotes the current page to the first page. Only one output block is allowed per page. When a Dashboard view opens, only the reports on the current content page are executed. All other reports are executed when you click the respective content page tab. Reports on content pages do not automatically refresh when tabbing from one page to another. To refresh a report, click the Refresh button in the toolbar for that report. Select the Personalize link in the banner. Add Page to add a page that contains content blocks. Add Library Page to add a page that contains the Report Library user interface. You can also add the Watch List interface after adding a library page. Add Schedules Page to add a page that contains the ReportCaster user interface. Add Deferred Status Page to add a page that contains the Deferred Status user interface. Note: You will not be able to view Library or Schedule pages if you do not have access to ReportCaster or the Report Library. Enter the tab name in the Page Description text box. When a page is added, it is added as the last page. You can rearrange the order of the content pages using the Move Left, Move Right, or Set Default buttons. The Set Default button promotes the current page to the first page. Note: When creating a content page, wait until all page items appear before using the buttons on the page. If an error occurs due to premature use of the buttons, refresh the page using your browser Refresh button. From the View Builder, select a public or group view. Note: When creating a Public View, the Add Library, Schedules, and Deferred Status buttons are available. However, these pages are not displayed on the Public page if they are included in the Public View. They will show for any user who inherits the Public View as their My View when they access Dashboard. Additionally, users who do not have access to ReportCaster or Report Library will not be able to view the Library or Schedule pages. The Library Page will display in Public Views if the Public User has been given Library privileges. When creating content for a public view, the Administrator can add a Library page to the view. Clicking the Add Library Page button in the View Builder adds the Library tab, as shown in the following image. 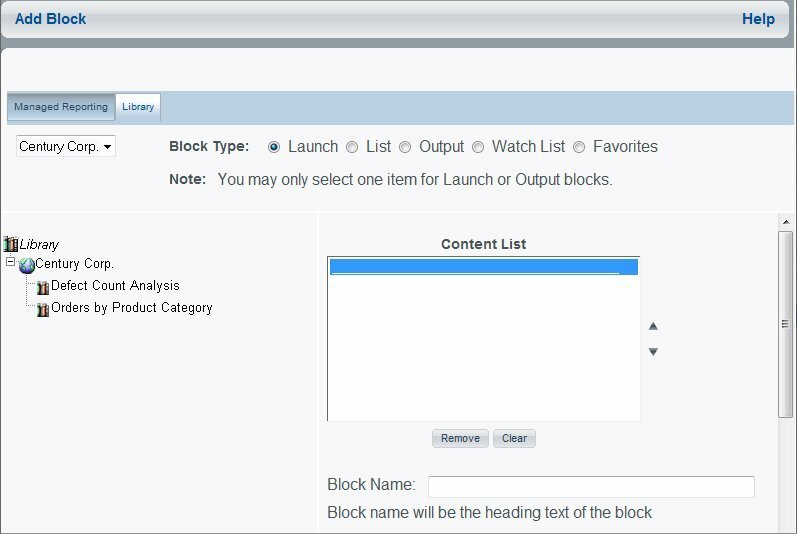 When adding a content block, the Administrator can select content from the Library to be placed in a launch, list, output, watch list, or favorites block. An additional tab, labeled Library, is available when adding or editing a content block that allows the Administrator to view Library content available to the public user and select it to be added to a public view. The following image shows the Library tab (in the Add Block window) that provides access to Library content.